Time for my monthly visit to Eternal Maker and a nine-patch photo collage selection of quilting and dressmaking fabrics that have caught my eye this month. 1. Blend Fabrics Daydream Green Faraway Forest by Lizzie Mackay Beautiful dreamy monochrome design- see the other pastel colours of this print here. 2. Studio E Small Talk Text Sewing themed words text print fabric. 3. Makower Town Riverbank This design works like a border print so perfect for a gathered skirt formed of rectangles so the riverbank buildings and painterly work in horizontal bands around a skirt. This could work well in a quilt too. 4. Riley Blake Lovebugs Envelopes This is such a cute fabric and could work as a feature or as background in a quilt. It would be lovely for a little girl's dress too. See the rest of the Lovebugs collection here. 5. Riley Blake Navy Polka Flower By Melly and Me a clever new take on the classic navy/off white polka dot design. 6. Riley Blake Lovebugs Text This would make a very special quilt backing fabric. Love love love all the way! 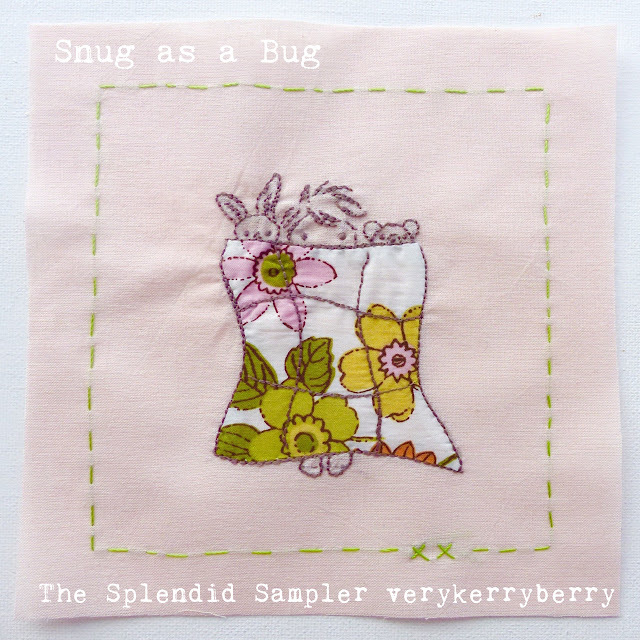 See the rest of the Lovebugs collection here. 7. Riley Blake Idle Winds Jersey/knit fabric 95% cotton/5% spandex. The addition of spandex gives this knit fabric good recovery so tops and legging won't bag out at the knees and elbows. Good weight for dresses too. 8. Studio E Small Talk Symbols Brilliant low volume print! 9. Hokkoh Grey Fox Scallop Pincord. A fine soft corduroy fabric suitable for clothing, craft or quilting. 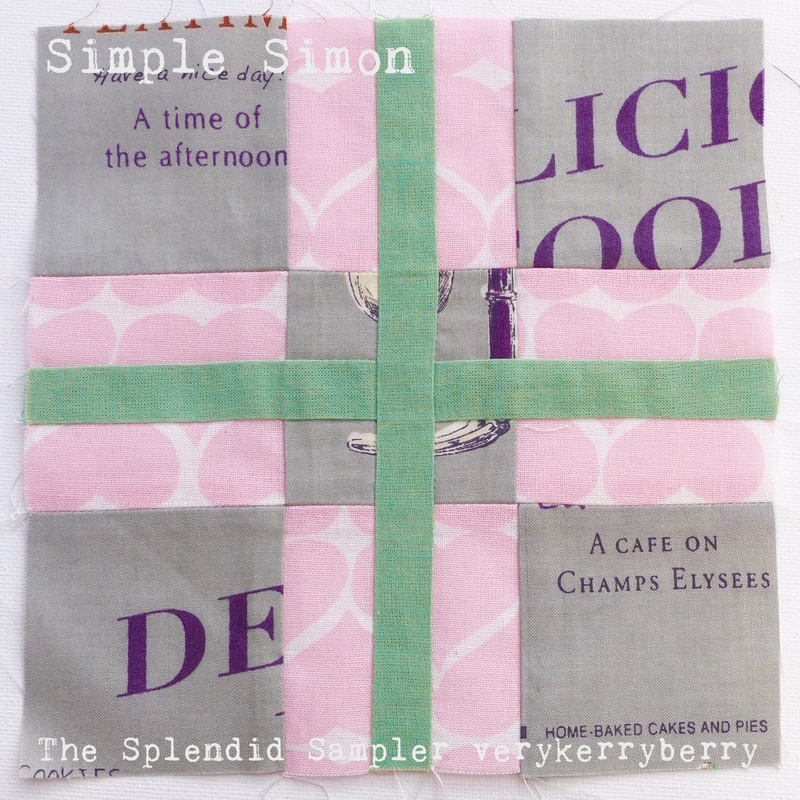 I've got to know Wendy Ward through Instagram, especially sewing photo events like #miymarch16 when you post a picture each day following a list of sewing themes. She's got a long background in the industry and I have huge respect for her work. 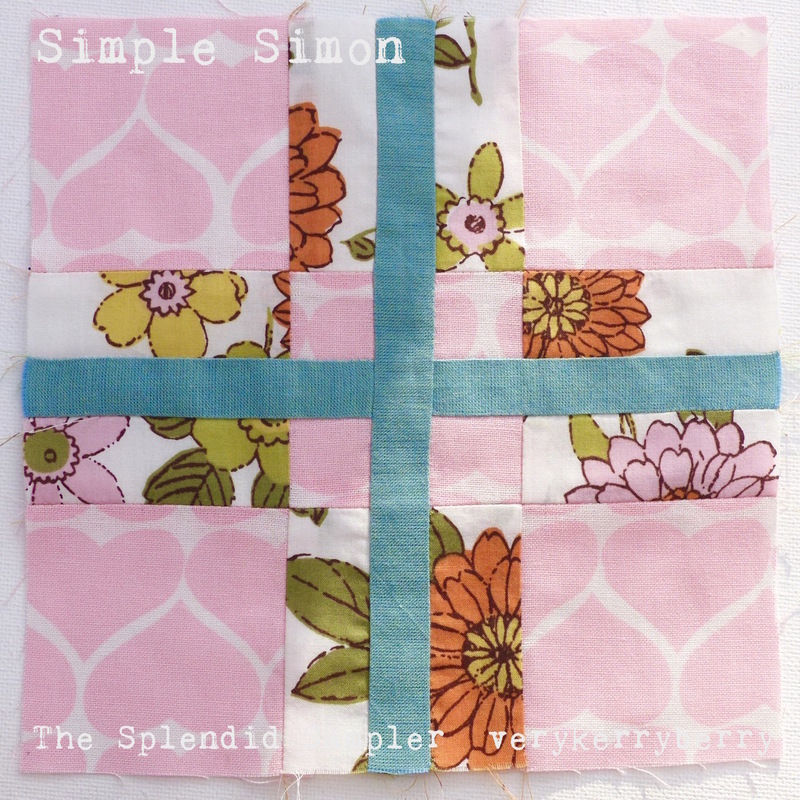 She explains the basics of sewing so well- see this example on sewing machine settings from her blog - and is an industrious and independent spirit writing books as well as regular features in sewing magazines, running workshops and designing her pattern line. 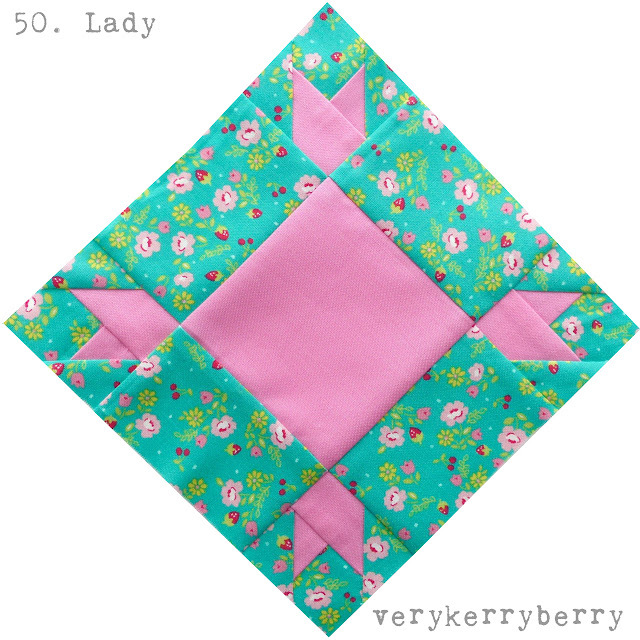 I got in touch with her recently for my Sewing World column and when we were emailing each other she asked if I'd like to try a pattern and review it here. I chose the Longley Cardigan and here it is! Wendy's patterns come in a bag and with a detailed A4 size instruction booklet. The pattern pieces are printed on large paper- copy shop style. For this style I checked my bust measurement which fell smack in the middle of the small range and cut the pieces out of paper without tracing- I know living life on the edge. It is a beginner friendly pattern- a page of the pattern is dedicated to information about knitted fabrics- their characteristics and how to sew them. On the pattern pieces, the seam edges are given letters and these are referred to in the instructions. 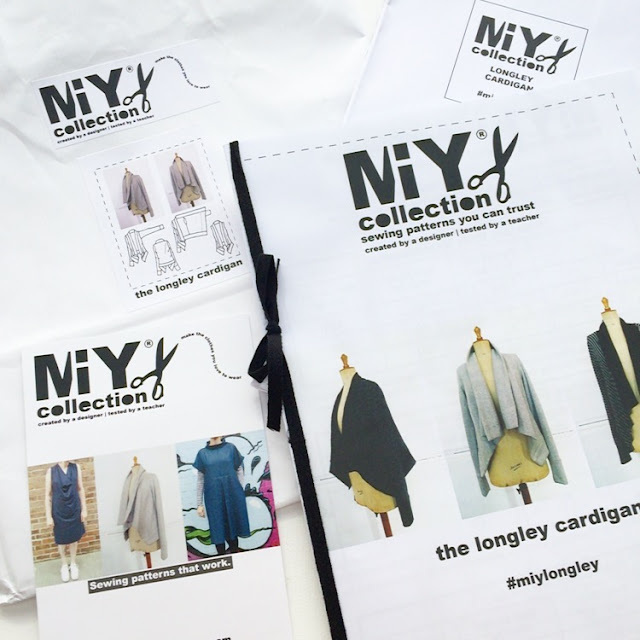 There are lots of diagrams to support the written instructions and the Longley Cardi can be made using an overlocker or on a standard sewing machine. I used a mix of a Brother 1034d overlocker and my Bernina 830 record with a walking foot. 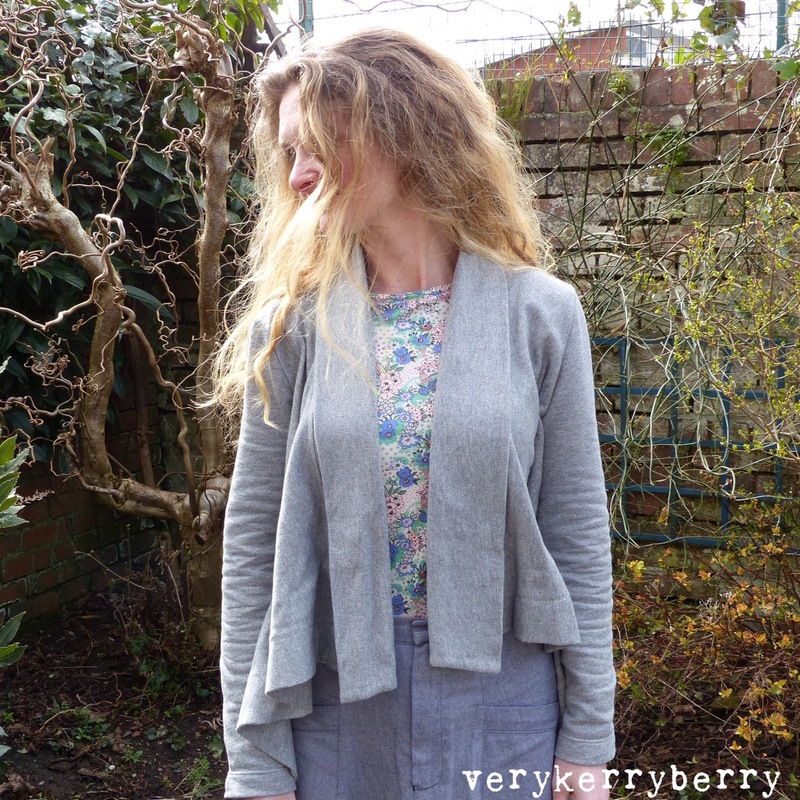 I made the cardigan from a lovely quality draped cotton loopback medium weight fabric from Ditto Fabrics. 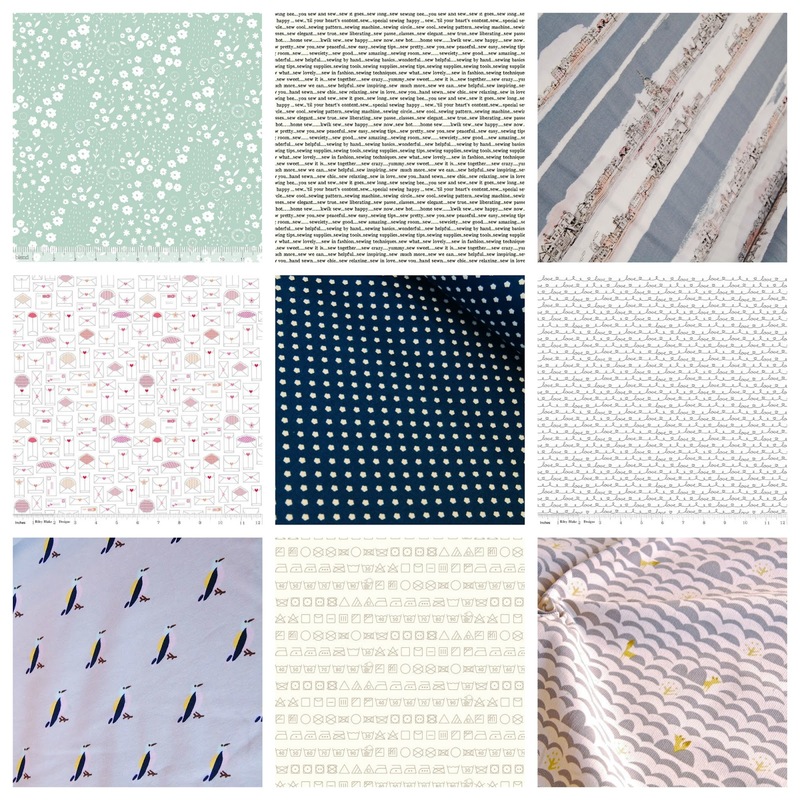 I've bought a selection of jersey fabrics from Ditto over the years and they have always been of very good quality and this was no exception- sadly it has sold out for the moment. When sewing a thicker knit fabric I usually refer to this very helpful Indie Sew Bulky Knits blog post and I used the settings specified as that machine matches mine! On my sewing machine I use a Bernina walking foot and a 90 ballpoint needle. The pattern is clear and easy to follow. The cutting plans are accurate and there is relatively little fabric wastage and the fabric quantities specified were perforce. 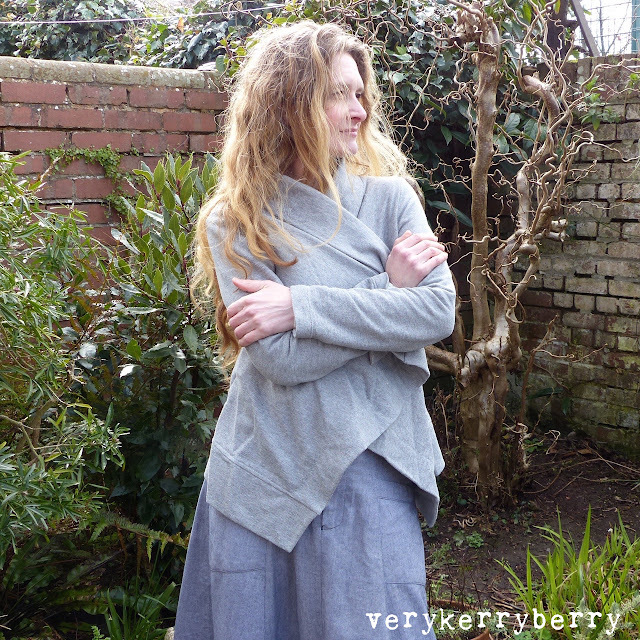 I used a knit that was over 150cm wide and it took 2 metres (that width/quantity applies to all three sizes). The only thing I changed on the pattern was not adding the sleeve cuffs. 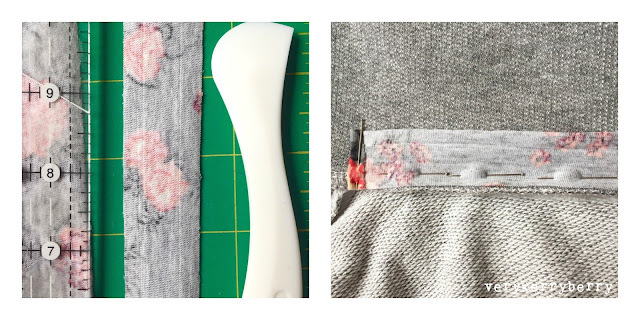 I read Rae's post and also Anna's review before I sewed it up so I knew the sleeves would be on the long side and so I turned up the sleeve ends by 1 ¼" and sewed a double needle hem using this method. Cut a 1 ⅛" width 14" strip of jersey or bias fabric. 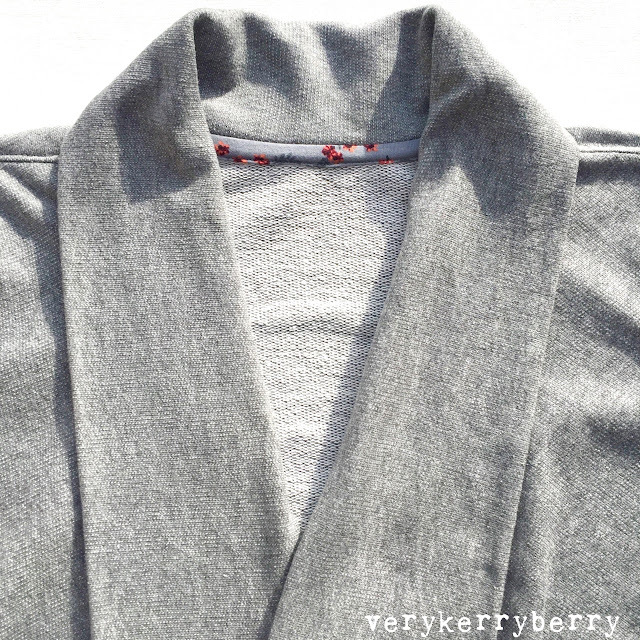 Place the fabric strip along the neck seam (this should be pressed downwards). The crease of the strip will be lying against the seam line. Pin in place. 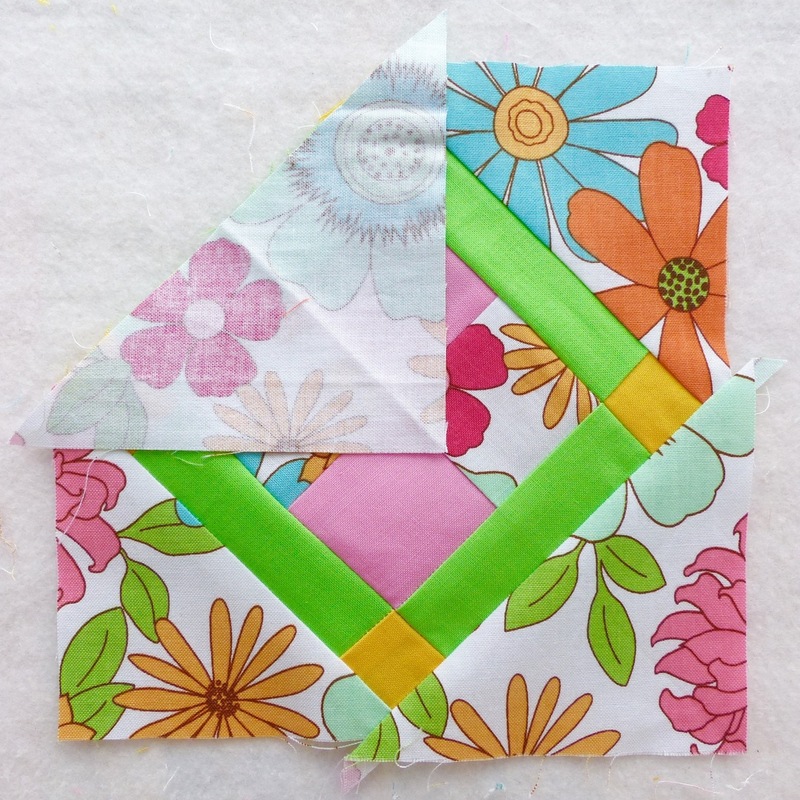 Stitch along the crease using a slight zig zag to allow for a small amount of stretch. The start and end of the strip will be folded over. At the end of the stitching, trim the strip so there's an extra ¼" to fold inwards and stitch over it. My stitch settings were 0.5 width and 3 length. Flip the fabric over the stitching and press downwards. Fold the long raw edge so it tucks under the neck seam and pin into place. 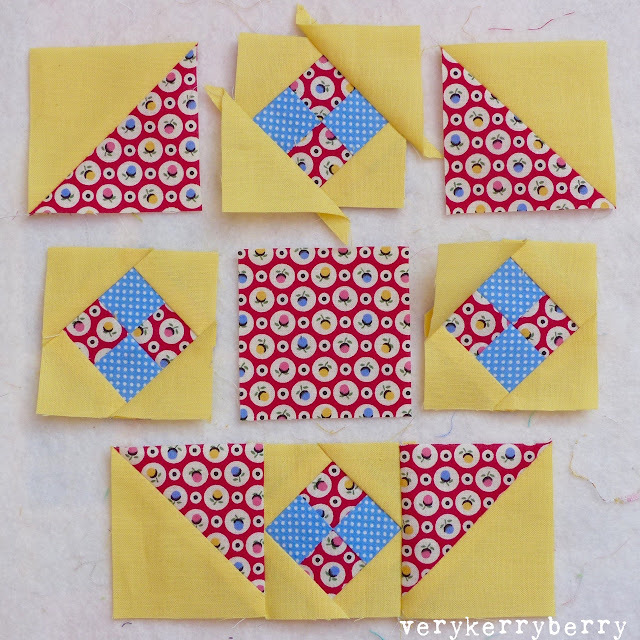 Starting at the short edge and pivoting at the corners, sew along the bottom edge of the strip. I added some top stitching along the shoulder seams, the front neck band edges and the hem band just using a long straight stitch. These aren't areas that need to stretch and even though I had pressed everything I wanted the seams to stay firmly down plus I liked the look of the stitching. The fabric is such great quality and it didn't distort or go wavy- on a lighter weight cotton/lycra jersey it may not have worked so well! I love the result. I've worn it every days since I completed it on Sunday, Even with the arrival of Spring, I know I need long sleeves for many more months and even well into the summer. 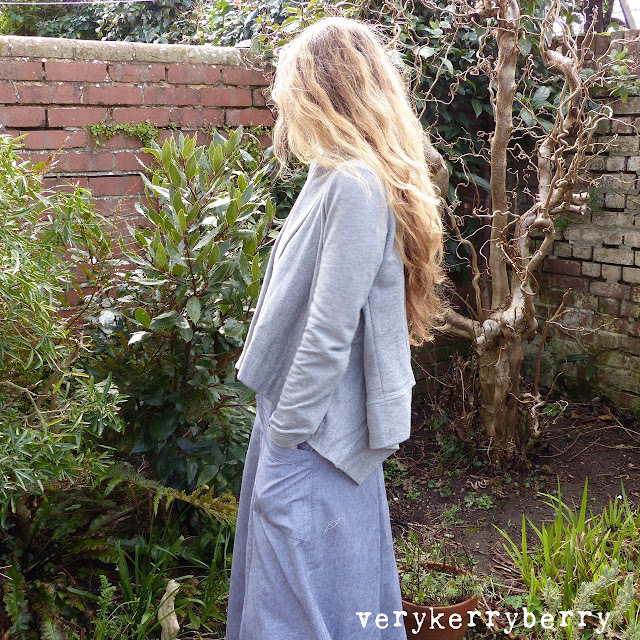 The Longley Cardi is perfect for keeping warm working from home, wearing to yoga and pilates as an extra layer, throwing on as a jacket when the sun's out. My daughter has already put her order in so a second is definitely on the cards- I just need to find the right fabric for her. I think it would work well in a Ponte Roma too with a smarter and more structured jacket sort of look. Recommended! 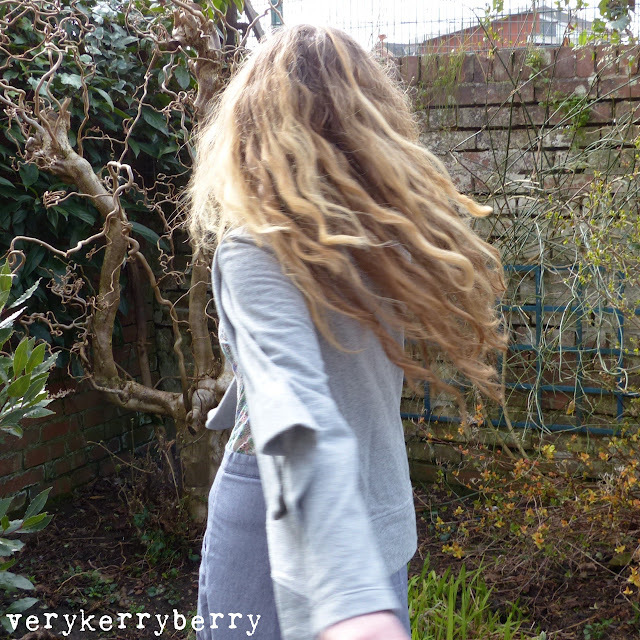 Changes- removed cuffs, turned up sleeve ends by 1 ¼". Welcome back to another Monday and two more farmer's wife blocks in the Farmer's Wife Quilt Along . 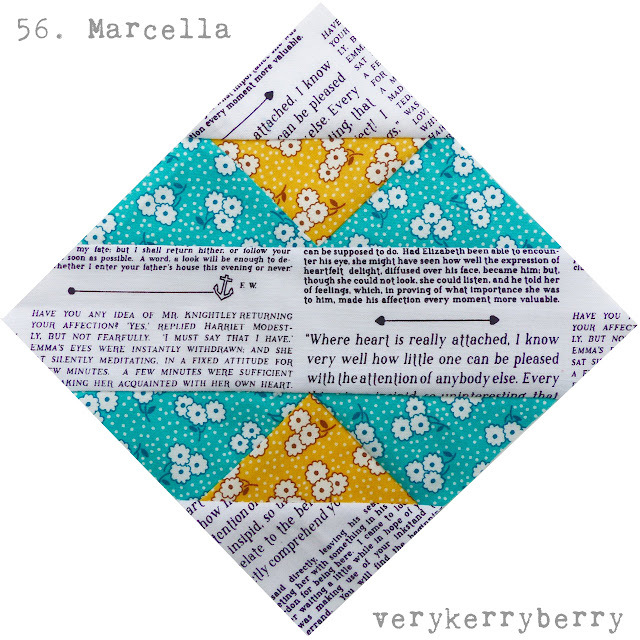 Erica from Crafty Blossom returns with a guest post for block 55, Malvina (p.214, letter p.121). I did this block as a half-block hence it is a triangle rather than a square. 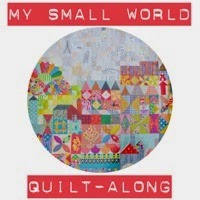 I plan to make a queen quilt following the layout suggested by Laurie in the book and I will need eight half-blocks, this is my second. Block 56, Marcella ( p.215, letter p.80) is a straightforward block with only two sections to join together if you are foundation paper piecing. I pre-cut my fabric so the piecing was quick to do. 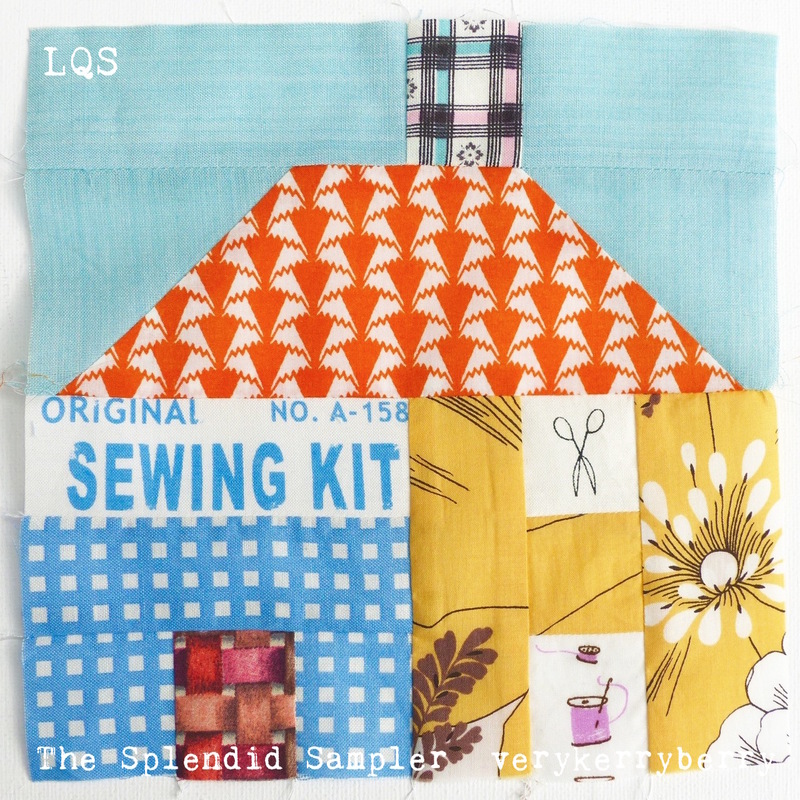 I used this fabric selection before on block 23 Charlotte and I liked it so much this seemed like a good chance to repeat and echo it in the finished quilt. There's a sweet little reminiscence of childhood tea parties to read in the farmer's wife letter on page 80. For individual blocks, you can use #Malvinablock and #Marcellablock on Instagram, Fat Quarter Shop and Angie are using these hash tags, #fw55malvina, #fw56marcella, I'm using both hashtag systems. Jo from My Bear Paw is back as guest blogger next Monday. Time for my monthly visit to Plush Addict. For this month's nine choices I've picked a mix of quilting cottons, dressmaking fabrics and one useful choice for any sewist. My colours have veered towards a spring-like pink/aqua/neturals palette, despite the fact that it's been grey and cold all day in my little city! 1. 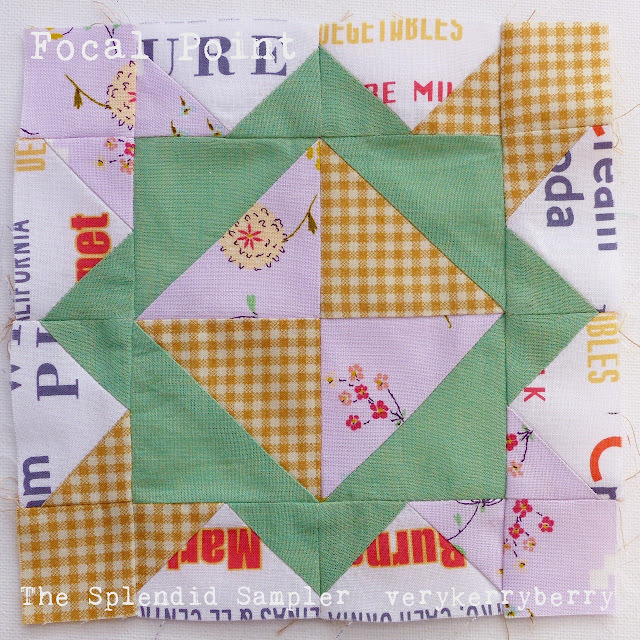 Sarah Jane Pockade Summer (Sommer Collection). Plush Addict have some of the lighter colour way from this winning and very popular collection. 2. Cotton Lawn- Mint Spot. This looks like a good choice for dressmaking- shirts and tops. It's a wide width at 145cm so good value too for a silky cotton lawn. 3. Michael Miller Arrows Metallic in Bright White. I thought this print worked well with the other spring quilting cottons I'd picked and a little fussy cutting could make great directional use of the arrows too. Other prints and colours from the same range are here. 4. 100% pink Silk Organza (comes in other colours) I bought half a metre of this recently after reading Karen's blog post on making a pressing cloth. It's excellent stuff, it resists the heat and is sheer so you can see what you are pressing. Well worth the money and half a metre will make two pressing cloths (or one massive one!). 5. 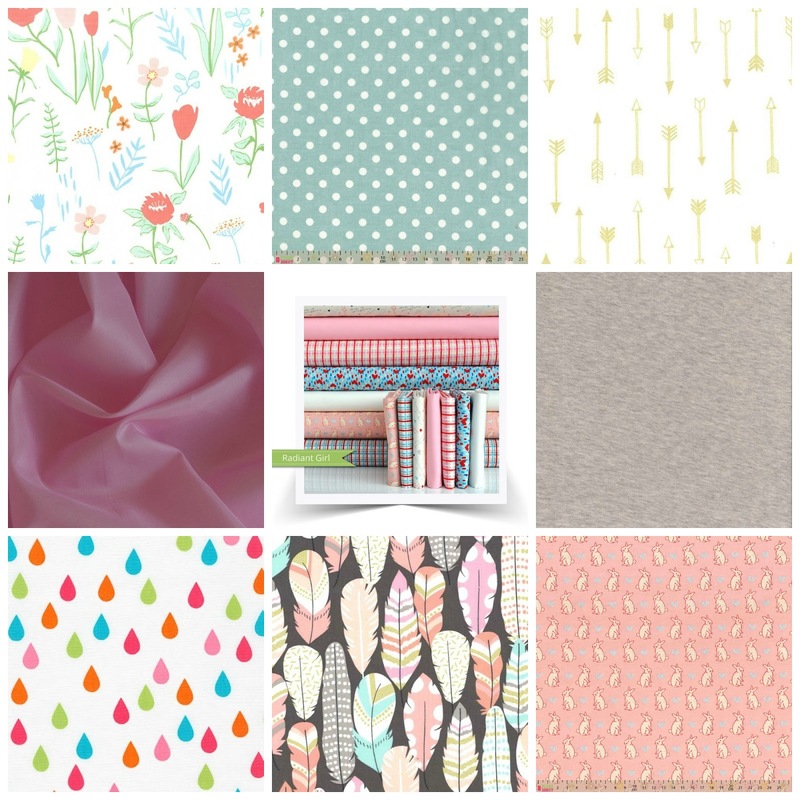 Radiant Girl FQ bundle: 5 prints and two Kona solids. 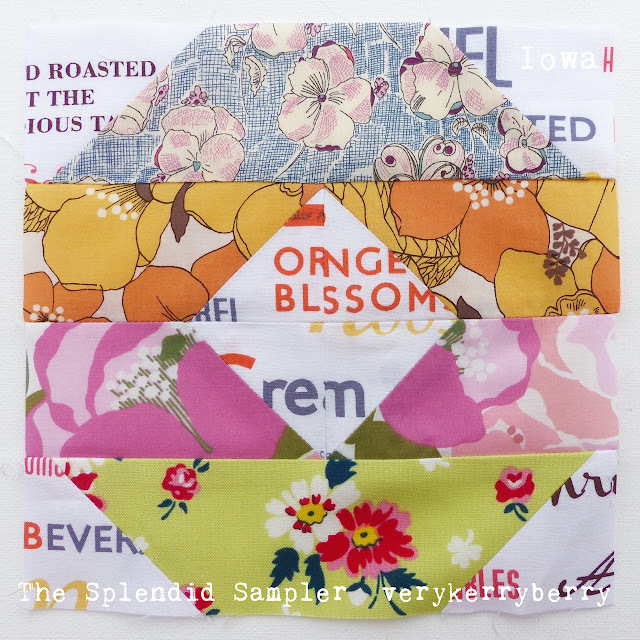 A lovely spring mix of prints. 6. Ponte Roma in Oatmeal. Perfect weight for a spring jacket like a Grainline Morris Blazer. Ponte is a double knit, stable fabric and the small amount of stretch makes such a differernce for comfort and wear. Lots of High Street shops sell Ponte Roma jackets and blazers. 7. Robert Kaufman Whatever the Weather - Raindrops Rainbow. Rain themed prints are popular at the moment (maybe it's the British obsession with weather?). There's this range -more prints here, and also Michael Miller's Pitter Patter selection. 8. Michael Miller Arrow Flight Plucked Coin. A very pretty selection of colours in this print. Busy, busy, busy. Work, home and some difficult stuff involving a relative with a likely Alzheimer's diagnosis and trying to co-ordinate assistance from many miles away. 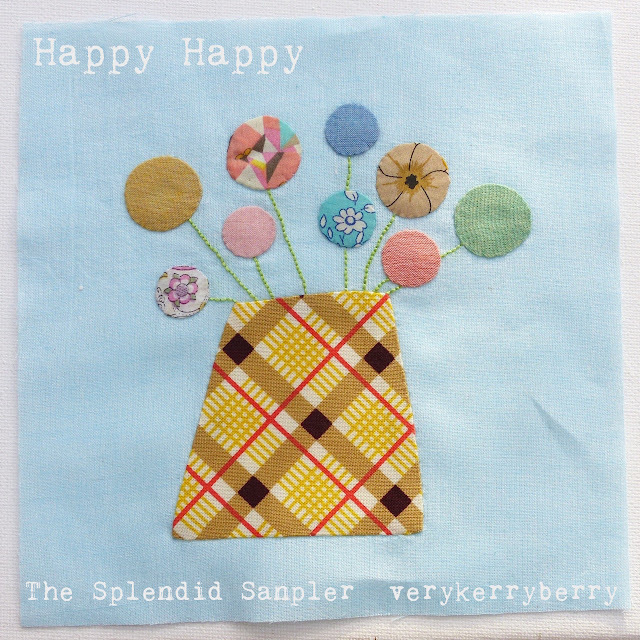 I've been squeezing in the occasional The Splendid Sampler blocks although these were sewn a little while ago- there might be a hiatus in the next few weeks...click the links to find the designers, tutorials and more details. 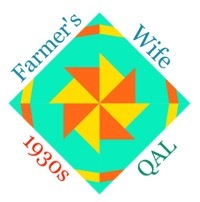 This week we are looking at blocks 51 and 52 in the Farmer's Wife Quilt Along. 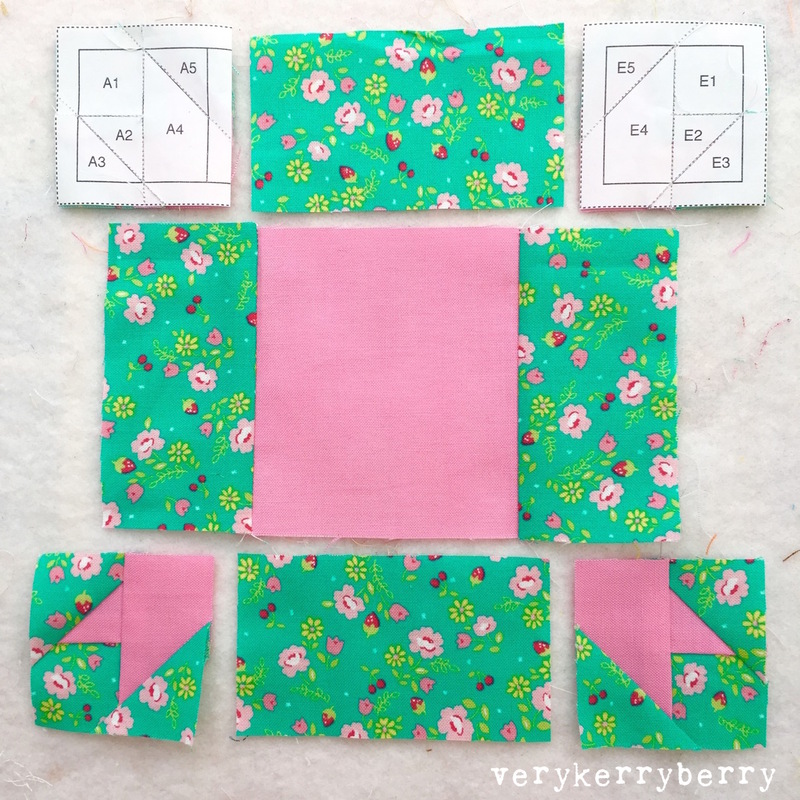 Block 51, Lily (p.210, letter p.34) and Charise is back with a guest post on this block and some very pretty fabric choices. 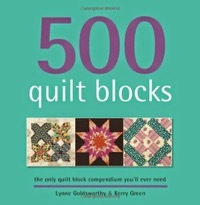 If you plan to follow the quilt layout suggested in the book, you could consider Lily as a half-block option for the top or bottom edges - see this post for more info. Here's my version- I know it looks weird in this format, like something is missing! It took ages and was tricky- there are a lot of sections even though I only did half of the block! I pressed each section seam open. 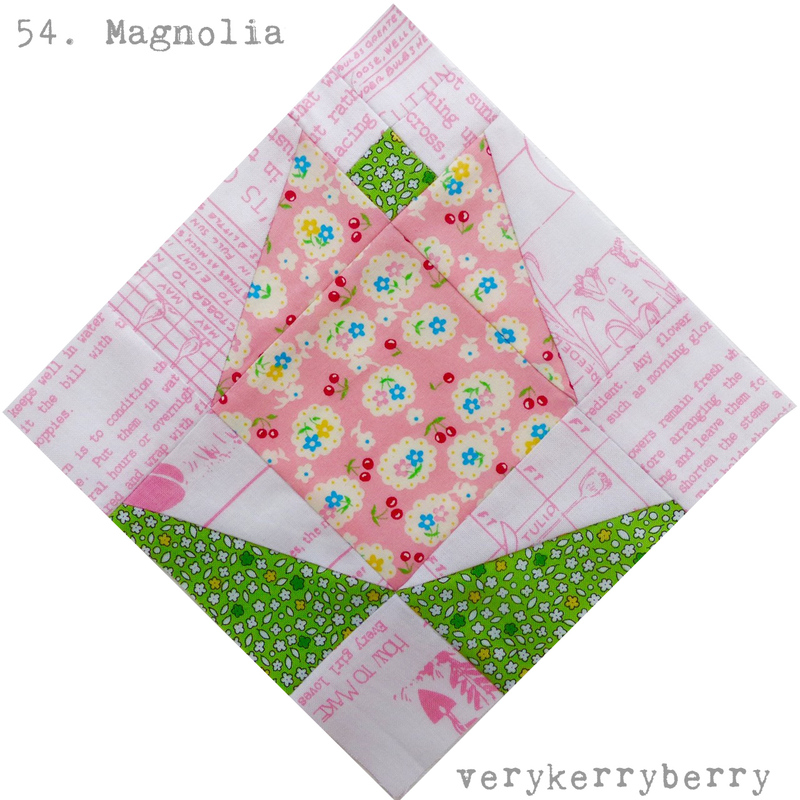 In contrast, block 52( p.211, letter p.15) is quick to sew. I pre-cut larger pieces (dimensions below) and foundation pieced. Add triangles E and F without paper. It helps to find the centre of the diagonal of each triangle and make a finger press crease so it can be centred with the 4-patch square the middle as it joins on to the block. Trim the blocks to 6 ½" after both half-square triangles have been added. 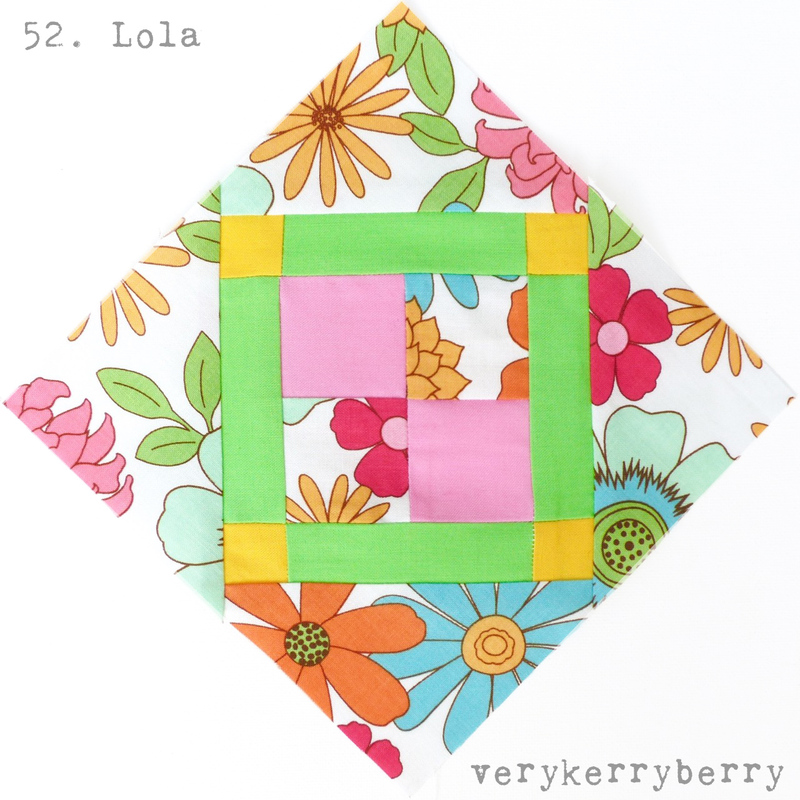 For individual blocks, you can use #Lilyblock and #Lolablock on Instagram, Fat Quarter Shop and Angie are using these hash tags, #fw51lily, #fw52lola, I'm using both hashtag systems. Fiona from Poppy Makes is back as guest blogger next Monday. 1. Dritz Ezy-Hem Gauge: a great piece of kit for dressmakers or anyone who regular needs to turn a hem to a specific length. 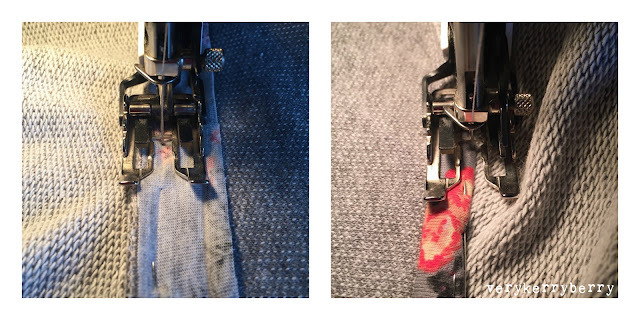 It's a metal gauge on which fabric is folded and presses to the desired hem size. It has curved and straight edges as well as metric and imperial measurements. First time I've seen them on sale in UK, I had to get mine from a friend in USA. 2. In Theory Wavelength in Gold: one of the new prints from the In Theory organic barkcloth fabric range from Jessica Jones. The weight is heavy, like curtains but it also has a softness so it's good for interiors (curtains/cushions) or clothing with structure (jackets/dresses/skirts). I plan to make a sticky out A-line skirt with pockets. This seems to be the hottest print. Find others here. 3. Riley Blake, Farm Girl Cherry Pie: I love cherries and so it's hard to resist the cherry print. 4. Hokkoh, Linen Trees in Mustard and Pink: a cotton/linen blend, good for bags and cushions. 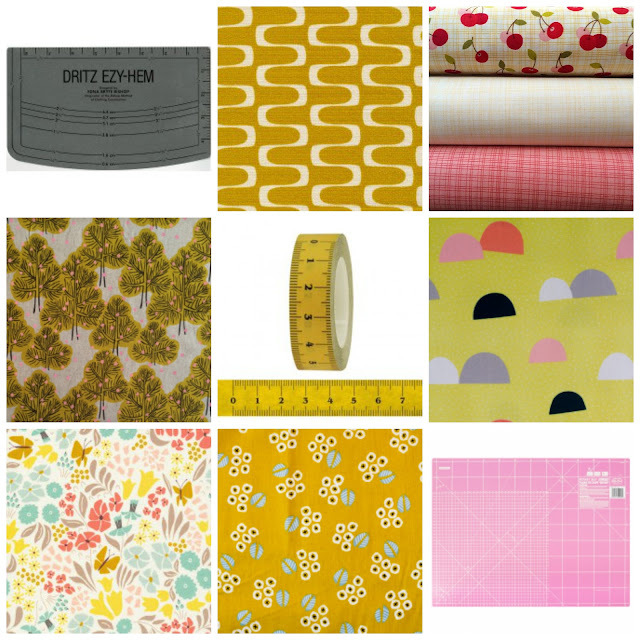 themed washi tape, perfect for destash parcels! This is one of my favourites. 6. Pikku Saari- Saaristo in Lemon: larger scale pattern on cotton/linen blend. Other gorgeous prints from same company here. 7. Park Life Hyde Park in Multi- Elizabeth Olwen for Cloud 9. Pretty floral/nature painterly collections all featuring swans seem to be multiplying at the moment- see Sommer, Spring Walk and the forthcoming Swan Lake. I can't help but fall for them all! The Full collection of Park Life can be found here. 8. Muddy Works-Eucalyptus in Mustard: gorgeous floral print on a soft drapey cotton sateen, perfect dressmaking fabric. 9. Olfa Self Healing Cutting Mat, 18" x 24" (metric on reverse). Cutting mats are usually a green colour, who wouldn't love a pink one? 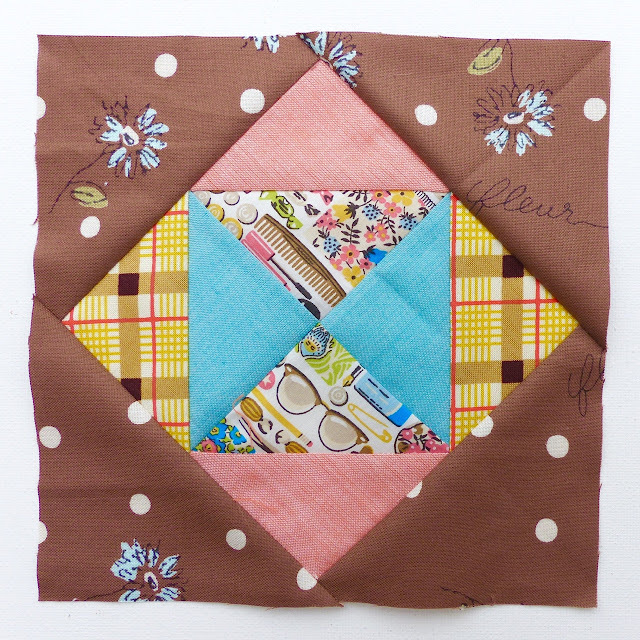 Welcome back to the half-way point for block construction in the Farmer's Wife Quilt Along. 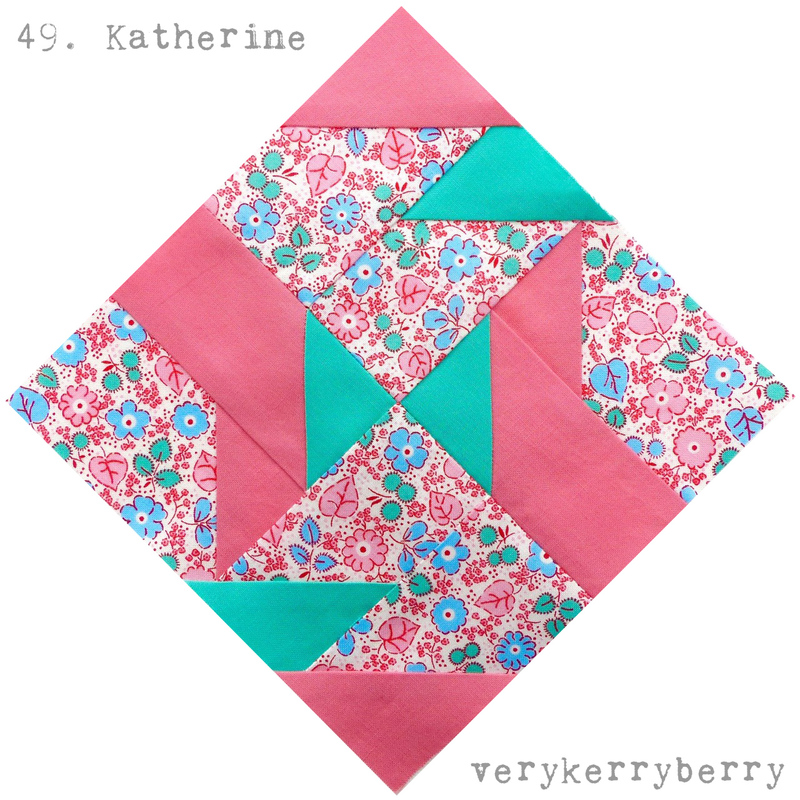 First [ this week is Katherine (p.208, letter p.28):and Sarah from Pretty Fabrics and Trims has written a guest post on this block on her blog. I loved sewing this block. I foundation paper pieced as usual, it's a fast block to make with only two sections to join together! Here's my version. For block 50, Lady (209, letter p.142), I used a mix of foundation piecing and rotary cutting. I foundation pieced the corner sections A, C, D and E (adding ¼"- ½" to each of the rotary cutting dimensions allows for this) and rotary cut the large rectangles and centre squares at the correct size and pieced that section without paper. For individual blocks, you can use #katherineblock and #ladyblock on Instagram, Fat Quarter Shop and Angie are using these hash tags, #fw49katherine, #fw50lady, I'm using both hashtag systems. If you've been sewing along, congratulations for making it to the 50 block point! Only 49 to go and you already have an impressive stack of blocks made over the last few months! Next week, Charise returns as guest blogger. I am enjoying the range of blocks from straightforward rotary piecing, through to appliqué and embroidery. It's good to mix it up a bit and I always like the chance to challenge myself- although I felt at home foundation paper piecing a 6 inch block with Natalia Bonner's Focal Point design. If you feel you've missed anything, Pat and Jane have a very useful catch-up post with lots of handy links. Which techniques are you enjoying so far?